Swimming with sharks. Blazing trails for women in science. Inspiring new generations of ocean lovers. Founding a world-class marine laboratory. These are but a few of the many accomplishments of Dr. Eugenie Clark, who founded Mote Marine Laboratory in Southwest Florida. In February, Dr. Clark — "Genie" to her many friends and colleagues and "The Shark Lady" to the world — died at age 92 surrounded by family and friends. 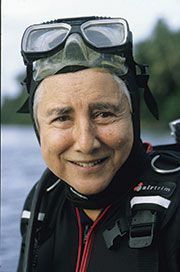 Genie's career spanned nearly 75 years of groundbreaking marine research focused on sharks and other fishes. She was also a teacher and a writer and always willing to share her love of the underwater world with others. On May 4 — her birthday — Mote Marine Laboratory and Aquarium will host a special memorial for Mote's Shark Lady. Please join us this celebration of the life of a very special woman. Who: The public is welcome. RSVP is required.